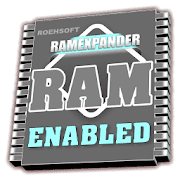 ROEHSOFT RAM Expander (SWAP) APK boost up more memory with a click! Roehsoft can expander up to 4GB Larger ram and more effective than any other android tool. Finally, more memory with a click! Memory from Android 1.6 up with root access and external SD card! More memory means that background tasks will never more automaticaly terminated, and many programs will work correctly in the first place! Extends every Android device up to 4 GB of memory in which it creates a swap file on the SDCARD. Maximum size of the swap file is architecture requires 4GB!